Which is Worse: A Game of Thrones Spoiler, or Detention? A French mathematics teacher is said to have devised a powerful technique for keeping classroom chatter to a minimum: Whenever his class gets too noisy, he simply writes a spoiler from Game of Thrones on the board. 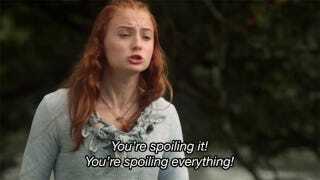 As in: "Oh, you haven't finished reading A Storm of Swords? LET ME TELL YOU EVERYONE WHO DIES." According to Belgium's Nieuwsblad, the teacher, at wits end with his noisy class, asked which of his students watched Game of Thrones. Around three quarters of the students raised their hands. "Well, I've read all the books," the teacher replied. "If there's too much noise, I will write the names of the dead on the board. They are enough to fill the whole year and I can even describe how they die." When students in the class decided to test him, he delivered on his word, writing the names of everyone killed through the end of the series' third season, "for those who [had] not seen it." This resulted in what one student described as "a religious silence" for the rest of the lesson. Nieuwsblad says the story was picked up from French site DansTonChat, where one of the teacher's students first related the event, so it's difficult to confirm its veracity. Still, is it really so hard to believe a teacher like this exists? Someone who is long since caught up with the first five books of A Song of Ice and Fire and has no qualms with ruining things for his students? More to the point, is it so hard to believe a teacher like this could exist? We can't help but hope that, somewhere out there, a teacher (who is also a rabid Game of Thrones fan) is reading this and deciding at this very moment to employ the spoiler tactic in his or her own classroom. Because it's evil. And it's brilliant.